At the restaurant, you taste it. At the concert, you hear it. At the clothing store, you feel it. Through your lenses, you SEE it. Because the quality of your vision depends on your lenses more than anything, you shouldn’t settle for bargain products and questionable guidance. With more new choices and possibilities than ever before, there are no shortcuts to selecting the proper lens. Maximizing your vision with the correct lenses takes knowledge, precise finishing and personal attention to your needs. At Adamstown Eye Care we take your vision and eye health seriously. Licensed professionals check and double-check your lens order with an clear understanding of how the lenses are expected to perform in your specific case. Your lenses are produced with materials supplied by a family-owned lab here in the US that’s known world-wide for its expertise and accuracy. We pay more for these materials because we know you will appreciate the difference. Our skilled and dedicated staff carefully monitors the manufacturing of your lenses as they are finished and finally fit, to insure your satisfaction. All of our lenses are guaranteed to meet strict US safety standards and are fully warranted against quality defects and premature failure. Traditional Bifocals, Trifocals and yes – Quadrifocals! Lens technology has advanced tremendously in recent years. The design and manufacturing of different types of lenses now includes methods that far surpass of what was possible even just a few years ago. Up until then, lens making hadn’t changed much beyond the basic techniques of lathe polishing that the Vikings used one-thousand years ago! So what’s so different now? Computer-aided digital (CAD) Free Form lens surface design and computerized numeric control (CNC) carving machines can create lenses that are far more advanced than ancient designs. Galileo and the Vikings never had access to this technology and it’s still out of reach by all but the most modern labs today. 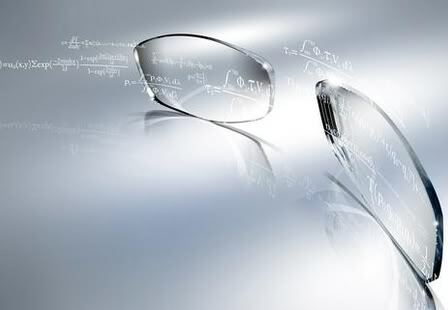 The lenses are simply too complex and cannot be physically made using common outdated equipment. It would require a nearly infinite number of physical tools using traditional equipment to create the unique lens features that a modern Free Form generator can produce. No old-fashioned lab can afford to create and stock that amount of tooling. What’s so cool about these lenses? Since everyone has a lens prescription as unique as they are, the new technology makes it possible to produce lenses that fit the exact requirements of the patient. The old way was to just mold or polish a lens that was designed to work for the average wearer. But who is really average, anyway? We all have our own requirements – including our unique prescriptions, lens materials, frame sizes, fit and special lens features. Every one of these choices affects the quality and clarity of the final lens. The only drawback to this new technology is that the machines that can produce Free Form lenses don’t exist in your average lab. You won’t find Free Form generators in the 1-hour or discount mall stores. In fact, many large wholesale lens manufacturing labs don’t even have the technology. Operating the machines is way too expensive and requires highly skilled operators with extensive training. Discounters won’t make those investments. Many lens retailers confuse the public on purpose by offering lenses they call “Digital” or “High Definition” so you’ll believe that they have all the newest equipment. Digital lens technology is not the same thing as Free Form technology. Almost anything can be called “digital” – like using a digital computerized measuring device to check the fit of your frame. But that’s doesn’t mean you’re going to receive a real Free Form lens. Yes, all Free Form products are digital (computer generated,) but just calling it digital doesn’t mean it’s really an advanced Free Form design. Because Free Form lens tech is complicated, rapidly changing and often misunderstood, the consumer should be wary of misinformed amateurs attempting to explain and provide the correct products. Count on Adamstown Eye Care to keep you informed and provide you with the newest and most advanced lens designs – anywhere on planet Earth!